I opened the bright red box and ripped open the package inside. I soon had the cellophane off and the pieces all over the floor. The building started immediately… I looked at the picture on the side of the box and started putting pieces one on top of the other. Soon I had my first creation. My first Lego fabrication was a success and it only took five minutes. Later on that bright Christmas morning, I open another package that my grandmother gave me. It was a 500 piece puzzle. My Grandmother (Or MoMo as we called her) loved puzzles and she gave me one of a bright red 1957 Chevy. I opened the box and dumped the pieces on the floor. This was a little different than the Lego set. Where do you start? I looked at the picture on the cover of the box. This was the goal, “but how do you get there?”, my little 7 year old mind wondered. I noticed quickly that some of the pieces were different… they had a flat side to them and they would be the border pieces. It only took a few minutes to round up all the flat pieces and put the outline of the puzzle together. Once I had the border boundary done, it was much easier to start working my way inwards with individual pieces. The next row of pieces were easy since there was a black border around the car picture. From there every piece was a challenge and you had to experiment with them to make sure they fit. Within a hour I had a good start on the puzzle and I finished it up later in the week. The puzzle was a slow but challenging process, but the final masterpiece was amazing to a 7 year old. I had really accomplished something. Lego’s and Puzzle pieces are a good analogy for accomplishing a goal. In both cases the picture goal is painted for us on the box, we just have to put the pieces together. In a previous post, we talked about painting our goal masterpiece. Now let’s put the pieces together. We have two different types of parts here. The Lego’s are uniform in size and shape and clip together easily. The puzzle pieces are similar in size but they differ in shape and pattern. Each puzzle piece is unique. Let’s look at the Lego analogy first. We have uniform pieces that come in a few different sizes and colors. For our goal example each piece might be a Life Enhancing Goal Opportunity. The standard Lego double brick equals a 48 minute time block. A Lego single brick is a 24 minute time block. The different colors of the blocks represent different activities. Let me give you a practical example. The Lego analogy works very well for the Body for Life exercise program. Monday: We complete a 48 minute upper body workout. One red Lego double brick. Tuesday: We complete 24 minutes of aerobic exercise. One blue Lego single brick. Wednesday: We complete a 48 min lower body workout. 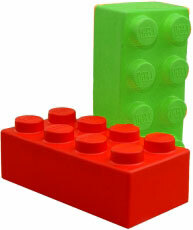 One green Lego double brick. Thursday: We complete 24 minutes of aerobic exercise. Friday: We complete a 48 minute upper body workout. Saturday: We complete 24 minutes of aerobic exercise. This represents one week on the Body for Life program. Multiply this by 12 weeks and you have completed the program or in the case of the Lego’s you have a small 72 piece item built. The key here is uniformity. We have two different size pieces and a few different colors. It’s quick and easy to construct. The Lego analogy works well for almost any goal with uniform pieces. In Toastmasters, for example, each piece would represent a speech, in Weight-Watchers each piece would represent a meal. Lego’s in fact work well for almost any paint-by-number goal. Success Goals are the same way, you can add multiple dimensions by creating goals in different areas of your life, such as health, financial, spiritual, and recreational. Sometimes we have a picture in our minds of something we want to accomplish, but we don’t know how to get there. We know what we want but there is no set path or uniform way to get to the destination. Like the puzzle, we need to set boundaries and create a foundation. Once the border is created, we can start to work inwards piece by piece. The key to making a puzzle work is that the pieces are uniform in size, but not in shape or pattern. For our goal analogy, having a uniform time period of focused work will really help. In previous posts, I have written about the power of a 48 minute focused work period. If we use that as our basic puzzle piece we can construct a 50, 100, or 500 piece masterpiece with relative ease. A good example of this type of goal is writing a book. You have an idea in mind and have painted an elaborate picture. It’s a little blurry in areas but you can see the painting pretty clearly. The first thing you need to do is create the border and boundaries. This is a sample of boundary pieces that contain your goal. Without these you have an unwieldy mess and you have no starting point to work from. Let’s continue inward and add an border to our picture. Here we can outline the chapters and create a working inner border. These are some outline pieces that form the inner border of our boundary pieces. From here it is a step by step process at add pieces about each dog, moving further inward until the whole picture of the dog is revealed. Soon the whole puzzle is starting to come together. 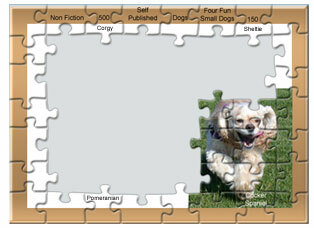 To create an inner puzzle piece, you’ll sit down at your word processor and write for 48 minutes about one of the dogs. Then take a 12 minute break and then you can start on the next piece. Focused piece work. The book comes together piece by piece, and soon it is ready to send to the publisher. The final odd pieces like the table of contents are added to fill in all the blanks. Soon your puzzle is done for everyone to see. Your goals are made up of pieces. If they are uniform, build a wall, block by block. If you have a strong foundation you can build it many layers high. If your pieces are a puzzle, start with the boundaries and work inward. Make sure your goals are measurable, and create an outline of the project. Keep working inward until all of the pieces are filled in. Later this week we’ll have some specific paper based tools to help with your success goals. Goal Setting: Process or Outcome?